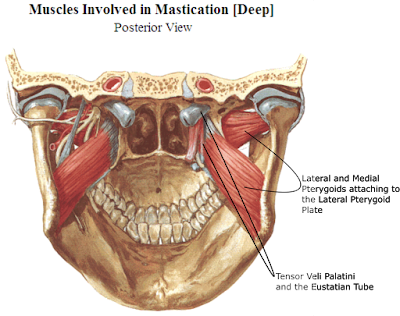 In the last blogpost, I discussed the muscles of mastication with an emphasis on the masseter and the pterygoids. Also, the channel relationships were discussed, including a look at the Large Intestine sinew channel and its possible trajectory traversing the pterygoids. In this post, we will explore ways in which these muscles of mastication can be influenced with an acupuncture needle directly. Some of these techniques are very straightforward and will be in the range of techniques that are taught in school, though I often find that the actual anatomy is not emphasized. So, it will be useful to look at the specific anatomy associated with common acupuncture points. Other techniques might be beyond the skill set taught in school and I advise you to use your own judgment when using these, as they involve deeper needling and a more precise understanding of anatomy. First and foremost, in the last blog post we discussed certain Stomach channel points and their relationship to the masseter muscle. These were ST-5, ST-6 and ST-7. Depending on the source you look at, the masseter has two or three layers of muscle fibers. I described three layers in the last post, a superficial, an intermediate, and a deep layer. I locate ST-5 just anterior to the superficial fibers of the masseter and just superior to the angle of the mandible. The superficial fibers create a very palpable border and the intermediate fibers are less distinct at ST-5. However, a palpable taut band of the masseter is usually apparent if you crossfiber it in an anterior-posterior direction. And you can feel that this band is still anterior to the much more obvious superficial fibers. So, needling ST-5 perpendicularly directly into this taut band will access a common trigger point in this region, one that often refers to the eyebrow and can be a contributing factor to headaches that project pain to the eye region. 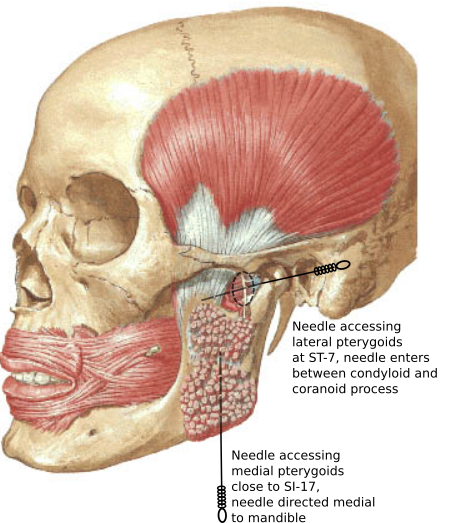 Another possible needle method would be to thread from ST-5 to ST-6 which would crossfiber the masseter. ST-6 would be in the belly of the masseter and is another common pain generator, often referring into the teeth, especially the lower teeth. This can be needled at ST-6. The needle direction is mostly perpendicular. Palpation with the finger first can fine tune needle direction, and I often find a slight medial direction slightly angled to ST-4 often elicits the strongest sensation. 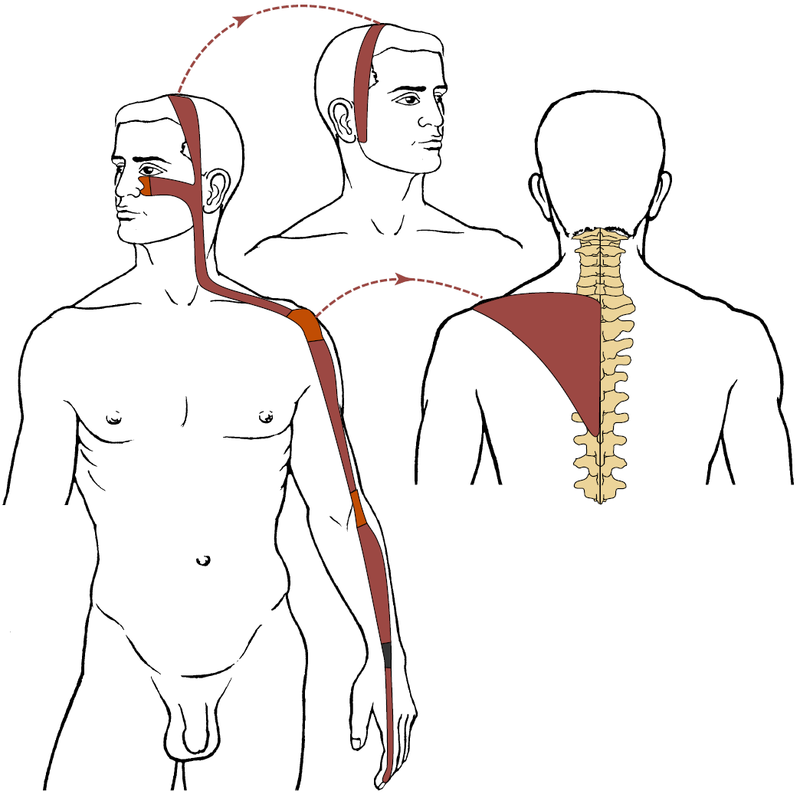 ST-7 has the ability to address two muscles depending on depth and angle. It can address the deep fibers of the masseter and a common trigger point with referral to the ear. 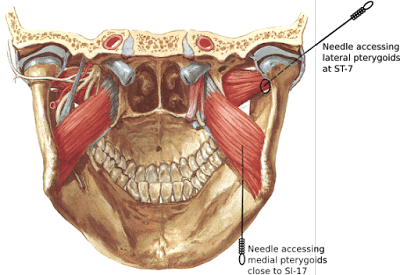 However, deeper needling can access the lateral pterygoids. The lateral pterygoids refer pain to the ear and to the upper teeth or maxillary sinus region. Pain from the lateral pterygoids can contribute to TMJ disorder and can be a contributing factor to sinus pain. Dr. Janet Travell, MD describes injection at a region consistent with ST-7 (she does not reference specific acupuncture points, however) for both the medial and lateral pterygoids, but she keeps the patient's mouth in an open position by having a cork between the upper and lower teeth. This is especially necessary for the medial pterygoids. While this is an appropriate method for accessing the medial pterygoids, this would be much more valid if there were not needle retention. She is describing injection, so there would obviously not be needle retention in this case. If however, the plan was to retain the needle, there is another method for accessing the medial pterygoids and that is from an inferior direction by coming below the ramus of the mandible to the medial surface. If you palpate with your finger or thumb, you will feel a space. Your finger is much too large to get deep enough to reach the medial pterygoid, but you might be able to feel the lower attachment and you might note that this is very sore, especially if you have jaw issues. 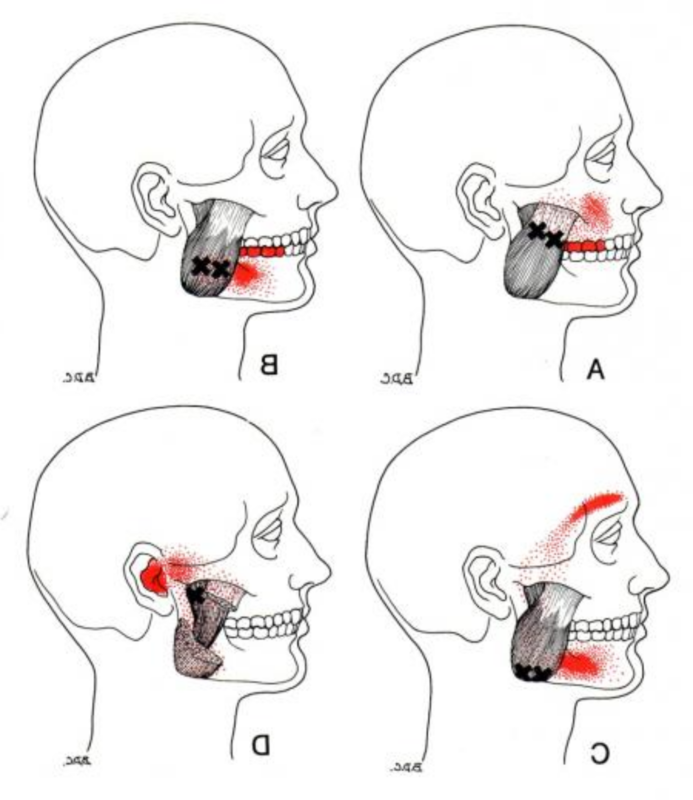 A 1.5 (40mm) can be used to reach the medial pterygoids from this inferior direction below the angle of the mandible. The direction will be superior in the same direction as your finger would push to reach the inferior attachment of the medial pterygoids and the needle will cross fiber the muscle and will elicit a strong Qi sensation. 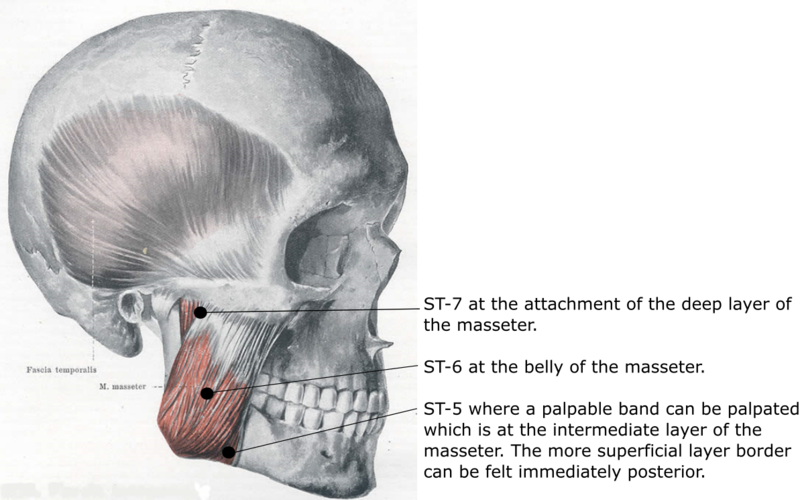 Another muscle of mastication which should be assessed when working with TMJ disorder, muscle tension headaches and other related disorders would be the temporalis muscles. The temporalis muscle differs from the masseter and pterygoids, in that it is more in the distribution of the Gallbladder channel. This muscle will be discussed in another post. The masseter muscle is one of the muscles of mastication (chewing) and is frequently involved with TMJ pain, but also headaches and other less considered symptoms. The masseter consists of a superficial, intermediate, and deep layer. All three are on the lateral surface of the mandible and can be palpated directly. The superficial and intermediate layer (considered together) attach from the anterior two thirds of the zygomatic arch to the angle and inferior portion of the ramus of the mandible. The deep layer attaches from the posterior one-third of the zygomatic arch to the superior portion of the ramus of the mandible. Both layers are accessible with an acupuncture needle and several stomach channel points directly traverse this muscle (Fig. 1). The medial pterygoids attach to the angle of the mandible on the medial surface and then attaches to the medial surface of the lateral pterygoid plate of the sphenoid bone. The lateral pterygoids attach to the lateral surface of the pterygoid plate and then to the condyloid process of the mandible (Fig. 3). 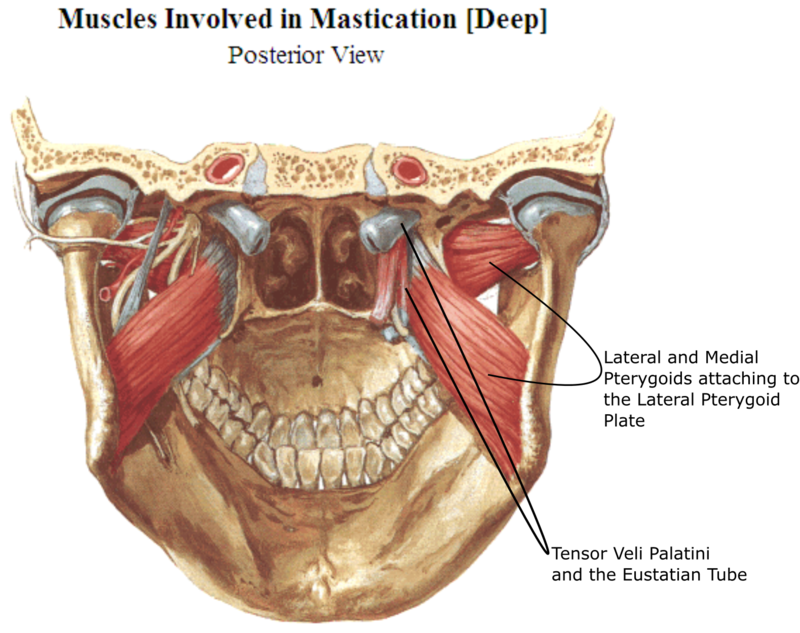 This blog entry will explore the pain patterns, symptoms, and channel relationships of the muscles of mastication with a primary influence on the masseter and the pterygoids. When considering the pain pattern of the masseter muscle, it is best to look at the superficial, intermediate, and deep layer separately. Trigger points in the superficial and intermediate layer refers pain to the lower jaw, teeth and gums and to the maxilla. 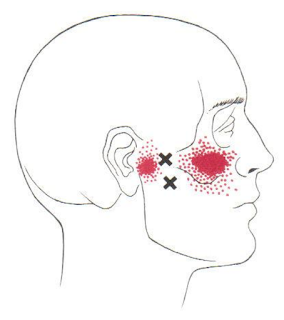 Trigger points with these referrals usually develop in the region of ST-6. In addition, trigger points might develop in the ST-5 (and posterior to ST-5) region which can refer in an arc across the temple and over the eyebrow. This referral can be a significant contributing factor to headaches, especially when other cervical muscles are referring pain to an overlapping area. This is often seen with a head forward posture as discussed in a previous blog post. In addition to pain, trigger points in the superficial layer of the masseter can cause tooth sensitivity to stimuli such as hot and cold. The deep layer of the masseter can develop trigger points which can refer to the cheek and TMJ, but often radiate pain deep into the ear. The ear referral is specifically caused by trigger points near the attachment at the zygomatic arch in the region of ST-7. This deep ear referral can be a cause of tinnitus which is usually unilateral, but the masseter can be dysfunctional on both sides, so it can also be bilateral. When bilateral, the patient might report that one side is worse than the other. If the masseter is causing tinnitus, the symptoms will often be aggravated or alleviated with opening the mouth wide as this will stretch the masseter. As mentioned above, several Stomach channel points (ST-5 – ST-7) directly affect the masseter and can be used as local points. Distal Stomach channel points also can be effective for softening the masseter. ST-44 can be an effective point and looking at actions and indications in Deadman's A Manual of Acupuncture reveals many of the same symptoms described by Travell and Simons in Myofascial Pain and Dysfunction: A Trigger Point Manual. Notably pain in the teeth, pain in the eye, pain in the face, and tinnitus are all indication listed in Deadman for ST-44 which are consistent with trigger point referrals and symptoms of the masseter. 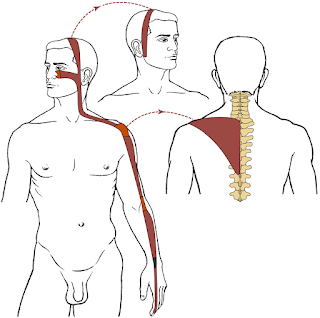 Personally, I find ST-44 a very useful point when there is exquisite sensitivity with palpation at ST-43. Often I will find this on the same side as the symptoms and it will not be as sensitive on the other side nor at similar regions such as LIV-3 or in the other metacarpal spaces. If ST-43 is not sensitive, sometimes ST-40 is very sensitive and feels bruised to the patient, in which case I include this point. In addition to the Stomach channel, the Large Intestine is frequently used for symptoms associated with dysfunction of the masseter. LI-4 is used by many practitioners and is often combined with ST-44 for tinnitus associated with the masseter, toothpain, and frontal headaches. However, consideration of LI-6 becomes more interesting. LI-6 is the Luo-Connecting point of the Large Intestine channel and it is at this point that the Luo-Connecting channel separates from the primary channel. The Luo-Connecting channel travels up the arm and, at the angle of the mandible, branches to the ear and to the teeth. Looking at the picture in Deadman (Fig. 5) or the classical description does not indicate depth. It is my opinion that the Luo-Connecting channel does not travel on the lateral surface of the mandible, but on the medial surface. This part of the mandible is really only accessible to palpation with a gloved hand inside the mouth. The muscles that you would be palpating inside the mouth on the medial surface would be the medial and lateral pterygoids. A couple of interesting things about referrals and symptoms of the pterygoids are worth considering to help bring life to LI-6. First off, the medial pterygoid refers pain deep to the ear and to the throat. This can interfere with swallowing and can contribute to soreness in the throat. In addition, this muscle has an interesting relationship to the tensor veli palatini muscle which, when you yawn or open your mouth, pulls the eustachian tube open and allows drainage and pressure normalization of the middle ear. Tightness of the medial pterygoid can block this function and be a major contributor to ear stuffiness (barohypoacusis) and can contribute to otitis media. Looking at LI-6 shows indications for dry throat and throat pain. Also, deafness is an indication and this indication is listed as one of the excess conditions in the Great Compendium or Acupuncture and Moxibustion. Many would agree that true deafness is unlikely to be successfully treated with acupuncture, but ear stuffiness and diminished hearing associated with it could potentially be treated, and it is possible that LI-6, via softening and releasing the medial pterygoid muscle, could potentially allow for better drainage and health of the middle ear. The lateral pterygoids has a very interesting pain referral pattern that first made me consider the connection to the Large Intestine Luo-Connection channel. Notice the similarity between the pain referral as depicted by Travell and Simons and trajectory of the Luo-Connecting Channel (Figs. 4 and 5). In addition, tinnitus and rhinitis are commonly associated with lateral pterygoid dysfunction and these are both indication of LI-6. Fig. 4: Lateral pterygoid TrP referral pattern. I will often palpate LI-6 when I am working with TMJ dysfunction or any symptoms associated with restriction in the muscles discussed (ear stuffiness or tinnitus that is associated with these muscles, for instance) and include it when it is painful to palpation. When LI-6 is painful to palpation, I find that it is about 50% of the time on the ipsilateral side and 50% of the time on the contralateral side, so it is worth palpating bilaterally. This is not surprising since both the Large Intestine primary and sinew channel cross to the opposite side of the body. I often needle this point by threading the needle parallel to the proximal edge of the abbductor pollicus longus muscle which produces a Qi sensation that travel towards LI-4. For a final thought, since so much muscle anatomy was explored, it is useful to look at the Large Intestine sinew channel. This channel binds at the nose. Much like the Luo-Connecting channel, I believe that this involves the pterygoids which ‘bind’ at the lateral pterygoid plate of the sphenoid bone (Figs. 3 and 6). Much of the Large Intestine sinew channel is more superficial than this, but I believe that the upper portion includes the scalenes and the pterygoids which are on the same myofascial layer. Actually, this portion of the sinew channel is really more obviously on the same myofascial layer as the Lung sinew channel which includes muscles such as the pectoralis minor. LI-6 has an effect on this layer for this very reason, in my opinion, as it is affecting a more Lung sinew channel layer that happens to be part of the Large Intestine sinew channel. Note: In the next entry we will discuss some local needle techniques for the pterygoids.